I am trying to use a synology drive for my repository on a network and it works for Veeam backup with no problem but not able to use the path such as ; \\fileserver\outlook with the veeam office 365 backup I get a error unable to connect to folder even though I can clearly map the drive with a letter? why is this. as you can see it the pictures I am able to see the drive path from my computer and access it. When I enter the path in veeam it turns green but when I hit NEXT i get the No such folder? I was told by synology this cannot be done..REALLY? WHY NOT? Same issue today on a Synology RXS3614, upgraded in SMB 3.0: "Folder does not exist". Anything else we can try? Or is there absolutely no way for the service provider to use his Synology NAS? @john510 : What argument did Synology gave you to justify the fact that their NAS cannot be used as a backup repository for O365 ? They said the following to me. Be sure that you have CIFS 3.0, from there if you have local system admin you have everything working as it should. Otherwise they have no answer for this. 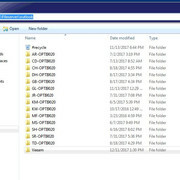 Permissions are set....in fact they work perfect for the Veeam backup solution of the entire computer but the Office 365 mail back will not work..
Its all so clear as day form the picture below that the drive and folder is clearly accessible for the computer but yet the Veeam office 365 backup agent ca not see it.. The left picture shows the folder that can be sen and tot he right Veeam backup 365 that see nothing other than the C drive.. 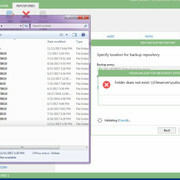 It's clear as a day that on this screenshot, you're accessing the share under two different accounts some user account to the left and VBO server's computer account to the right. By the way the pic to the left is a synology storage device showing its folders. able to see it from my computer but yet Veaam for office 365 does not. Again Veeam backup sees it fine but that another program entirely. 2) You will still encounter permissions issues. It will continue to cause permissions issues if you just try to assign the DOMAIN\Computer account to the share, so alternatively, add the computer account to a domain security group and then add permissions to said group. 3) From powershell, run Get-SMBConnection and verify under "dialect" variable 3.02. You may have to close out any existing SMB connections and re-open. This has worked for us, though per Mike Resseler above, you will find some performance issues. I am encountering a lot of ESENT errors for too many threads, no response, etc. on 2012R2 backup server when Veeam for Office 365 tries hitting its datastore on SMB share. Another method I am finding more reasonable from a performance and consistency standpoint is to set a local target as the backup repository. 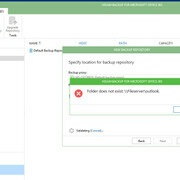 Then for archiving/multi-point backups, backup said local target to another location such as a NAS using Veeam B&R/Agent. 1. Created an AD security group and added the computer name of the server that is running Veeam O365. 2. On my NAS (O365-NAS), created a shared folder called "backups" and enabled Advanced Share permissions. 3. Ensure the AD security group created in 1. above has read/write permissions to the shared folder in both permissions and advanced permissions on the NAS. 4. Created a symbolic link on my Veeam O365 server pointing to the shared folder on my NAS e.g. "mklink /d c:\O365_backups \\o365-nas\backups"
5. 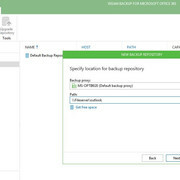 Create a new repository in Veeam O365, selecting C:\O365_backups as the destination. Now I believe that symbolic links are not fully supported, but this is working okay for me.